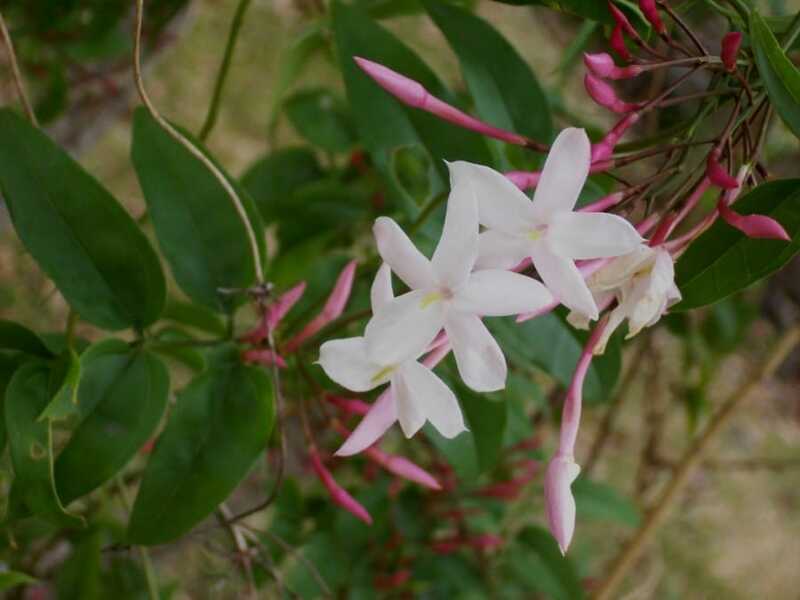 Fragrant, delicate, and exotic – there is so much to love about the vining, twining jasmine plant. If you’re looking for a delightful plant to grow indoors, look no further. Jasmine is the decorative indoor plant you have been looking for. Many gardeners shy away from growing jasmine indoors, as they believe it will be too challenging a task. On the contrary, jasmine is not difficult to grow inside if the proper growing conditions are provided. With a bit of care and practice, jasmine can be cultivated indoors by even the most novice of gardeners. If you’re considering growing jasmine indoors, consider these tips to help your plants survive and thrive in your home. Who Should Grow A Jasmine Plant? The short answer to this question? Anybody. Jasmine produces gorgeous winter blooms and sweet fragrances, releasing a delicate aroma late into the nighttime hours. If you prefer, you can also grow jasmine outdoors, growing it in a pot or hanging basket or even on a freestanding trellis. However, keep in mind that most kinds of jasmine are only hardy to zones 9 or 10. Therefore, growing jasmine indoors is best for most gardeners. This versatile plant can easily be grown outdoors, but is best suited for indoor gardeners looking for a fragrant, attractive option that will decorate their homes during the dullest months of the winter season. What Types of Jasmine Are Best For Indoor Growing? Not all jasmine plants are fragrant, but many offer a unique aroma that can add to the overall appeal of your home or indoor garden. You should select a jasmine plant based on your growing zone, even if you are planning on growing your plant inside. While your zone won’t play as much of a role in indoor gardening as it would if you were planting outside, keep in mind that factors like sunlight intensity and duration both affect how well your jasmine plant will grow inside as well as outdoors. Common jasmine (Jasminum officinale) is a common type of jasmine that is often grown indoors. A woody vine, it can grow to well over ten feet in height and, when grown outdoors instead of inside, attracts numerous pollinators. Smaller varieties of jasmine include Italian jasmine (Jasminum humile), showy jasmine (Jasminum floridum), and primrose jasmine (Jasminum mesnyi). These types of jasmine don’t grow over ten feet in height and have sweet-smelling, trumpet-shaped flowers. While they are typically grown outside on a trellis, they can also be cultivated indoors, though this is less common. Jasminum polyanthum is the most popular type of jasmine selected by indoor growers. Also known as winter or pink jasmine, it is a popular variety of jasmine that can grow in the winter and has a hardiness at USDA zones 6 to 10. It can tolerate a moderate frost and climbs as a vine to heights up to 15 feet tall. It can also be cultivated as a shrub. 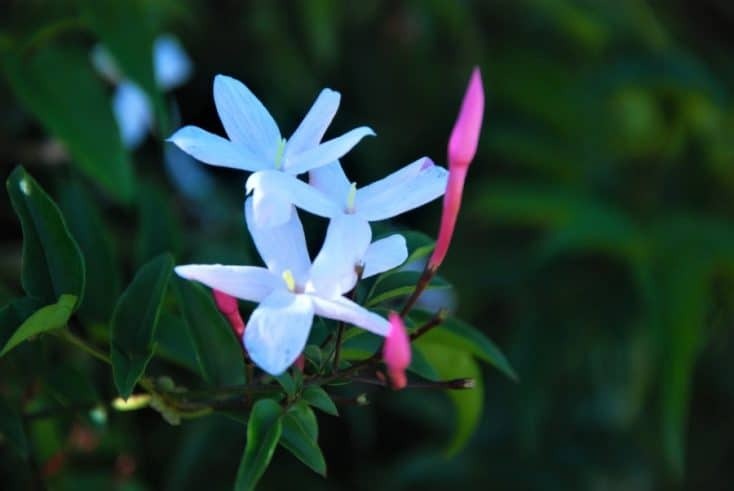 This kind of jasmine produces pink buds and delicate white flowers in the winter and early spring, with clusters of blossoms that completely cover the entire plant. Blossoms normally appear in late February and continue blooming throughout the spring and early summer. While this plant is a vining species that is often grown outdoors on a trellis, it can easily be cultivated as a container plant. When you purchase this kind of jasmine, it will be sold on rings when it is flowering. You can also purchase this sub-type of jasmine in indoor hanging baskets or repot it so that it grows in the format that is most convenient for you and your growing plans. Jasminum polyanthum is native to southwest China and has a distinctive, fragrant perfume. It has dark leaves that are ideal for decorating your house in the dead of winter, and produces pink buds just when winter’s bland color palette (or lack thereof!) is beginning to set in for the long haul. This kind of jasmine was first introduced to English gardeners in 1931, and was propagated in the United States shorty after. 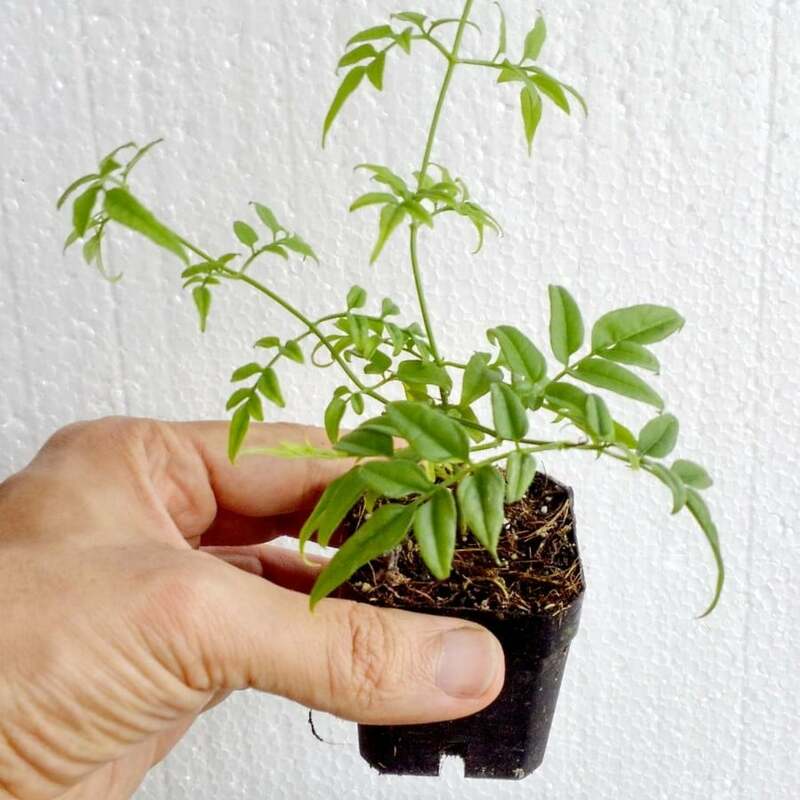 What Kind Of Soil Does A Jasmine Plant Need? When you purchase jasmine plants, you will quite often receive them on rings, regardless of whether you purchase them at a brick-and-mortar nursery or order them from an online retailer. Jasmine is usually potted in late spring, with rooted cuttings growing rapidly (up to six inches a day!). These cuttings are pruned back in order to develop strong, branching plants, with their stems gradually trained to grow along a wire form. Flower buds usually first appear in early to late fall, at which point they are ready to be shipped. 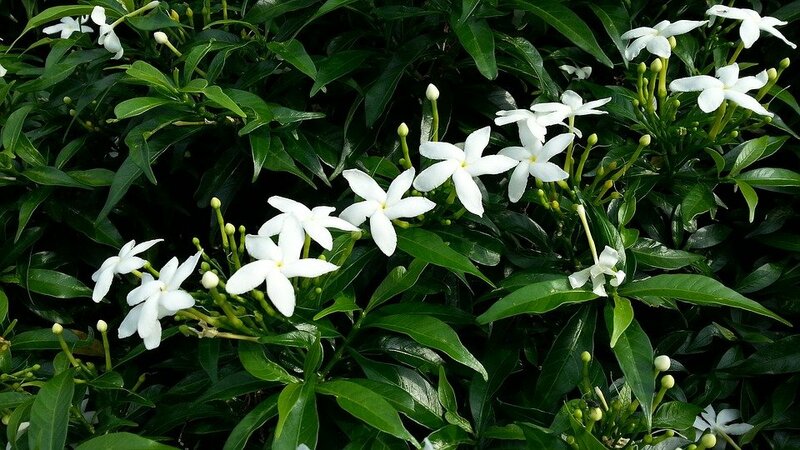 Jasmine plants are often shipped with their buds already set, meaning there is a strong likelihood that, once you get your jasmine plant set up in ideal conditions, you will experience a huge explosion of blooms and foliar growth. Jasmine plants prefer soils that are porous and well-draining. You can add materials like bark, coir, or other organic matter, which will help the soil drain and stay light and airy. You can also use sphagnum or peat moss to grow your jasmine, or even purchase a store bought potting mix. Ideally, a good potting mix will include a mixture of vermiculite, perlite, and peat moss. These mixes will help absorb moisture and resist compaction. Keep in mind that if you are using a store bought potting mix, it will not contain any fertilizer. As a result, you will need to add nutrients on a regular basis to ensure your plant is thriving indoors. Despite this, however, store bought potting mixes are a good option for growing delicate jasmine, because they will be entirely sterile and won’t contain any diseases or pests. How Much Water Does A Jasmine Plant Need? Jasmine plants are relatively low-maintenance when it comes to their water requirements. They need little water in the period after their blooms decline (which is usually in early winter as well as early spring) but benefit from a moist growing environment throughout the rest of the year. You don’t want the soil to be soggy, but it should be damp to the touch at all times. Water your jasmine plant once or twice a week. When you water, do so deeply so that moisture has a chance to penetrate through to the roots. I have a great guide about how to water indoor plants without making a mess which you should definitely check out. Watering your plant every day but only for a moment is ill-advised. This practice, commonly but mistakenly regarded as the “right” way to water by many gardeners, will not allow water to reach the plant’s thirsty roots. By reducing the frequency but increasing the intensity of your watering patterns, you will keep your plant perfectly hydrated. Due to the frequency that they need watered, you could try using a self-watering planter to maintain a moist environment for your Jasmine plant. Find out how self-watering planters work, and check out my favorite self-watering planters here. 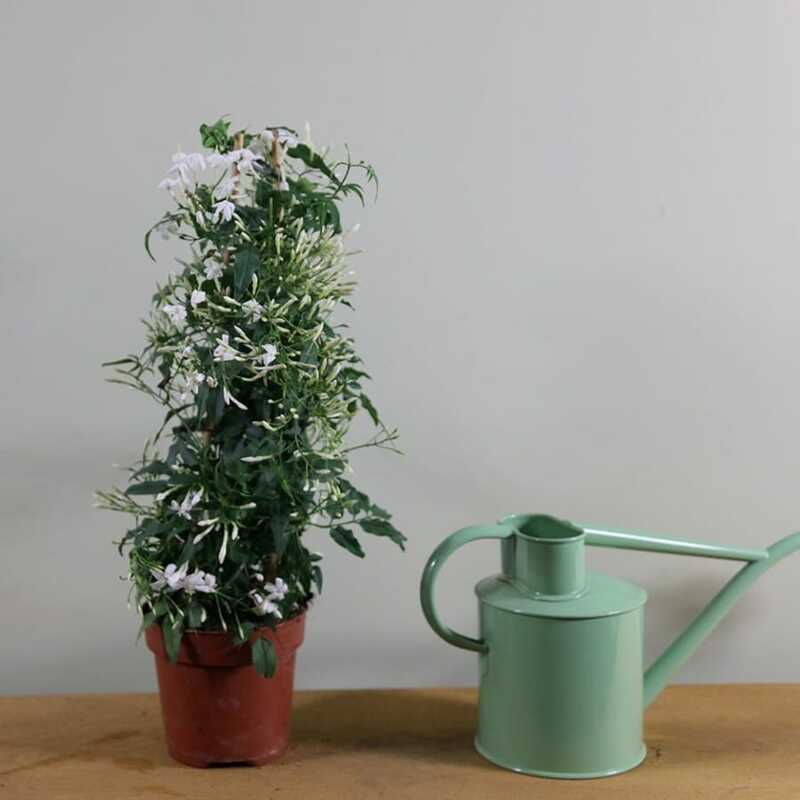 Alternatively, a watering globe or watering spike will do a similar job, and is a good option to help water your Jasmine plant while you are on vacation, or to use on a regular basis. Here are some more options to water your houseplants while on vacation. In the summer and early fall, you can allow your plant to dry out somewhat between waterings but you should try to keep the soil lightly moist. Your plant needs less water in the autumn months and more in the times when it is actively blooming. Jasmine plants prefer rooms with slightly cooler temperatures, which is why they tend to thrive in the colder winter months. They are sensitive to the dry conditions that are created by radiators, vents, and wood-burning stoves, so it’s important that you keep an eye on the humidity as well as the location of your jasmine plant, as it’s not solely affected by the amount of sunlight it is receiving. If you are having trouble with your jasmine plant drying out, there are several options for modifying the conditions without necessarily having to relocate your plant. For starters, you can run a humidifier near the plant. Jasmine plants need a relative humidity of about fifty percent or higher. If the air is any dryer than thirty or forty percent relative humidity, the plants’ roots won’t be able to keep up with the water lost through their leaves. While misting your jasmine plants can help maintain a good humidity level, it can be hard to keep up with this strategy, as they will need to be misted every hour or so. Instead, cluster your jasmine plant so that it is located near other plants. You can also rest your plant in a tray filled with pebbles, adding water until it fills the tray to just below the tops of the pebbles. Refilling the trays on a regular basis will help replace water lost through evaporation, while at the same time keeping the air near your plant moist and fresh. There are commercially produced humidifier trays that can also perform this function, but they are not necessary as you will need to fill the trays with water either way. How Much Sun Does A Jasmine Plant Need? Jasmine plants are delicate in that they need a very specific location in which to grow. Select a well-lit room or one that receives plenty of sun, as well as one that provides for good air circulation. Jasmine plants can only tolerate about four hours of direct sunlight per day, but need even less than this during the winter. You may need to close your blinds or move your plant at certain times of the year if you find that your plant is getting too much sun. Having your plant located in a southern-facing window can help improve its growth, as it will receive sunlight at its most critical times of growth. If your plants’ leaves have begun to droop, it is likely receiving too much sun and should be moved as soon as possible to a shadier location. Remember to clean the leaves of your Jasmine plant every few months. All indoor plants will slowly accumulate dust on their leaves, and this can impair their ability to absorb sunlight and to thrive. Learn how to clean indoor plant leaves with this easy guide. How Do You Fertilize Jasmine? Jasmine can be fertilized in a number of ways. You can use a diluted houseplant food throughout the entire growing season, or add a fertilizer that is high in phosphorus only to prolong the time period in which your jasmine blossoms. Jasmine should be fertilized every two to four weeks during the major growing season only, usually during spring and early fall. Don’t fertilize during the resting periods of late fall and winter, as this can damage your plant. When you fertilize, make sure you use one that is water-soluble. Use a fertilizer that is designed for houseplants and mix it at only fifty percent of the rate suggested by the manufacturer. If you apply fertilizer at full strength, there is a chance that it can harm your jasmine. Adding organic fertilizer is a great way to ensure your jasmine plant is receiving all of the nutrients it needs, without you having to worry about harming your plant with an excessively strong fertilizer. Consider adding organic matter like aged compost, leaf mold, or composted peat. Ideally, the soil in your container should contain roughly twenty percent organic matter. This will keep it moist for longer, and will also introduce crucial microorganisms and micronutrients to your soil. If you are adding a synthetic fertilizer, keep in mind that you will be adding only trace amounts of important micronutrients like sodium, calcium, and magnesium. These micronutrients are vital for the growth of your jasmine plant, yet synthetic fertilizers typically only contain nitrogen, phosphorous, and potassium. If you are growing jasmine indoors, you may need to add micronutrients that are naturally found in soil but are absent from fertilizers and potting mix. If you repot your plants, make sure the mix is light and provides plenty of airspace for oxygen, water, and nutrients to travel through. Because you are growing your jasmine plant indoors, you will not have the benefit of natural organisms like earthworms and processes like the weather to till your soil. 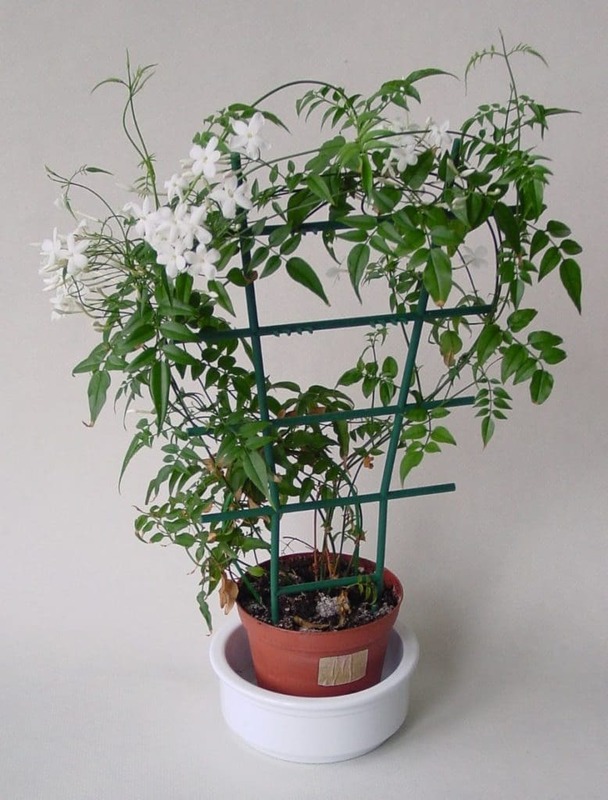 Do I Need A Trellis For My Jasmine Plant? In most cases, your plant will twine over natural supports on its own, leaning up against a shelf or wall for support when grown inside. However, you can choose to install an arch or another kind of trellis if you desire. Otherwise, the twining growth will have no impact on the overall health and wellbeing of your jasmine plant, so the choice is merely a cosmetic one that can be left to your own discretion. How Do You Get A Jasmine Plant To Bloom? Jasmine plants naturally bloom in early autumn as well as in the spring, but some varieties can produce blooms continuously throughout the year. Winter jasmine, for example, often blooms long into the winter months. If your plants aren’t blooming at these times, they likely have not been exposed to cool enough temperatures. You can place your plants near a south-facing window to help them grow indoors, and make sure you provide a trellis as well. A trellis will ensure that the plant has plenty of support as it begins to grow, increasing the likelihood that it will also put out fragrant blossoms. If your plant is not blooming, there is also a chance that it was not exposed to cool enough temperatures in the fall. Jasmine is relatively cold tolerant and likes to experience several weeks of nighttime temperatures around forty degrees. While you can’t do much to rectify this situation once autumn has passed, you can try to remedy the situation by placing your plant outside during the late summer and early fall of the following year. The easiest way to propagate jasmine is to use cuttings. Cuttings should be roughly three to four inches of length, with two sets of leaves at the top. Place the cutting in a soil mixture that is well-draining and nutrient-dense. Cover the cutting with a plastic tent or plastic wrap to help encourage growth and improve humidity. Then, place the plant in a well-lit room that is roughly 60 to 65 °F (15.5 to 18 °C). In about four weeks, you will see your plant beginning to take root, as evidenced by lush new growth. Take the bag off as soon as growth emerges so as to avoid fungal growth, then let the plant grow until its roots completely fill the starter pot. Can I Put My Jasmine Plant Outside? In the summertime, jasmine plants can benefit from spending time outdoors, but you don’t need to transplant. Transplanting is, in fact, ill-advised in the case of jasmine, because they are too delicate for outdoor conditions. Although they like cooler temperatures, they are not winter-hardy, and so you must make sure all danger of frost has passed before you begin transitioning the plant to outdoor growth. However, when the weather warms up in late spring, you can put your jasmine plants in a sunny spot, either indoors or out, to encourage more rapid growth. Before you introduce the plant to full sun, consider placing it in the shade first for a few days, which will allow it to harden off somewhat on its own. The plant will tolerate warmer temperatures, but really needs to be exposed to four or five weeks of nighttime temperatures that range between 40 to 55 °F (4.5 to 12.5 °C), with days that have plenty of sunlight. You should still bring the plant inside before a frost, but getting into the habit of bringing you plant outside and exposing it to consistent light that is not artificial will help it bloom more successfully in late winter. Placing your jasmine plant outdoors in the summer is not necessary, but can help increase the frequency and duration of your plant’s bud formation. Jasmine will typically set buds during the first six weeks of autumn, give or take, depending on your area’s climate and whether or not you have put the plant outside at all. Putting your plant outside encourages the formation of flower buds for the following winter. Do I Need To Prune My Jasmine Plant? Jasmine can be pruned as necessary, which will help control the size of your plant and keep it in a desirable shape. However, you should not prune after August, because this is when your plant will set flower buds. When you start to see new growth on your plant, you should begin pinching the stems. This will help promote further growth and is best done during the first two years’ of the plant’s life. Only pinch the top of the stem, and prune once blooming has finished for the season. When you prune, remove any dead foliage or tangled pieces. Never remove more than a third of the plant at one time, and make sure you are removing any dead or diseased areas of the plant. If you want your plant to grow in a specific direction (such as, for example, it has begun to encroach into an area where you don’t want its vines to travel), you can also prune it accordingly. How Do I Encourage New Flower Buds On My Jasmine Plant? Jasmine usually produces fresh new buds on its own, but it can be concerning if you find that your plant is not flowering. Before panicking, remember that indoor jasmine often takes a period of rest in the fall. To optimize this rest period, make sure your jasmine is completely shrouded in darkness at night. If you have your jasmine in a windowsill that receives artificial light (such as from streetlights), consider putting it in a closet at night for the fall months. If it’s not the rest period and your plant still is not producing new flower buds, there are several other factors to check. A lack of flower buds is commonly caused by over-fertilizing with nitrogen, which directs energy to growing foliage. To remedy this, fertilize with a phosphorus heavy plant food. This will allow your plant’s growth to shoot into high gear without compromising the health of your plant. Sometimes, the case may be that your plant has simply outgrown its container. Repotting your jasmine plant into a larger container can prevent your plant from becoming root bound and allow it to blossom freely. Finally, if you have tried all these solutions and still are not having any luck, consider your growing conditions. Make sure you are growing jasmine at the proper temperatures, with proper moisture and soil conditions, and with the proper amount of sunlight and circulation. These factors play a major role in the sensitive blossoming cycles of jasmine plants. Unlike many other houseplants, jasmine can wait for a long time before needing to be repotted. It actually thrives when it’s a bit snug in its container, so you really need to wait until it has totally outgrown its container before repotting it. Beyond that, repotting jasmine is relatively easy. It should be repotted in the spring, but only when the roots have wrapped themselves around inside the pot. When it is time to repot your Jasmine plant, its a good opportunity to pick a planter that will enhance the beauty of your home or that ties in with your decor. Check out some of my favorite indoor planters here. When you have more roots than soil, it’s time to repot. While this can be tricky to determine, you can usually tell your plant is ready to be repotted when you water it and it needs watering again after only a day or two. When you move the plant, be careful not to damage its delicate roots, and prune them as needed before moving them to fresh soil. To start, lay the plant on some old newspaper. Extract the root ball from the pot, and loosen them with your hands. Try to get rid of as much excess soil as possible. Cut off any long strands of roots that are wrapped around the root ball before making four or five vertical slices in the sides of the ball. Space the slices out, which will encourage new root develop, and then replant with fresh potting soil in a container that is roughly two inches larger in diameter than the previous pot. Why Does My Jasmine Plant Have White Growths? If you notice that your jasmine plant has white, cotton-like growths under its leaves and stems, there is a strong likelihood that your plant has been infested with mealybugs. These pests feed on the sap within the leaves and stems of many plants. While in small numbers they don’t do a lot of harm, increasing numbers will cause leaf yellowing and curling. Luckily, these pests are easy to get rid of. First, remove all of the masses that you can when you are pruning. Then, lightly douse a cotton swab in rubbing alcohol and then brush it gently over the affected areas. This will help to get rid of mealybugs now and also help to prevent them in the future. Other pests that are known to afflict jasmine plants are caterpillars, whiteflies, aphids, and mites. Of these, aphids are more likely to be found indoors than the others. They can be eliminated by manually removal, but that requires you to be vigilant and inspect your plant regularly for signs of bugs. You can also create a pesticide out of dish soap and warm water that you can lightly mist on the leaves of the plant. This will help get rid of aphids, as well as most other pests your plants may come into contact with, too. How Long Do Jasmine Plants Live? Like many indoor houseplants, jasmine has the ability to live for quite some time when cared for properly. Healthy jasmine vines can live for several years as long as you keep them well-pruned and placed in fresh potting soil. Why Are My Jasmine Leaves Wilting? Jasmine leaves often wilt as the result of fungal diseases. The most common to affect jasmine, like all other tropical plants, are blight and rust, which can damage your leaves and discolor your foliage. They can pass to younger stems or cuttings, so it’s important to get rid of these diseases as quickly and effectively as possible. Jasmine plants are also quite thirsty, so underwatering is another common cause of wilting. 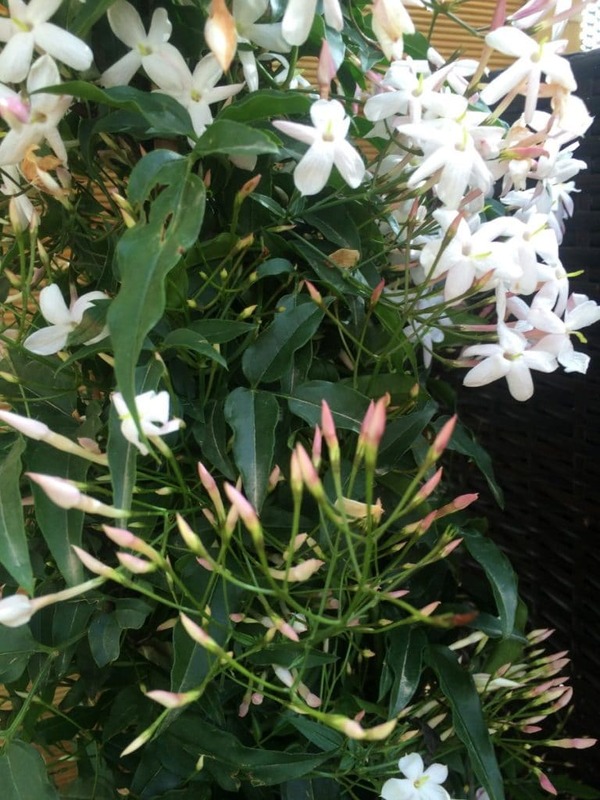 How Do I Get Rid Of Fungal Disease In My Jasmine Plant? Fashion a DIY fungicide out of baking soda and water to help get rid of the growth, and provide plenty of aeration and engage in proper watering techniques as a method of preventing the diseases in the first place. Jasmine is non-toxic to humans, cats and dogs, so you can safely put Jasmine anywhere in your house without concern. If you need some further ideas for non-toxic houseplants, here is my list of the most beautiful houseplants that are safe for cats. If you’ve been inspired to learn more about growing Jasmine and other houseplants, head over to my recommended resources section. This will help you choose the best books, tools, and resources to help you improve your knowledge, skills, and enjoyment of gardening.